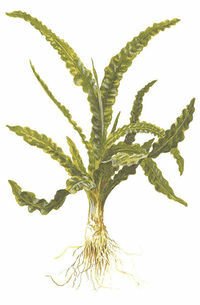 A relatively hardy plant as long as it is provided with enough light. It is not usually eaten by herbivorous fish and can tolerate low end brackish conditions. Plants that are thriving form a number of small bulbs. When planting this plant, the bulb must not be fully buried, the majority of it should remain above the substrate. A striking graceful plant which grows from a bulb. The leaves are dark green, tough and with ruffled edges. This page was last edited on 24 August 2011, at 12:07.